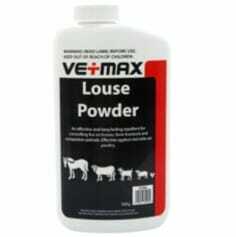 An effective and long lasting repellent for controlling lice on horses, farm livestock and companion animals. Effective against red mite on poultry. What animals can it be used on? All animals that don’t lick their own skin/fur. Such as cows, horses, donkeys, alpacas, goats, sheep, pigs and poultry. Apply an even spread of powder over the affected area on the animal or the bedding. No with-holding period for meat or eggs. It is a repellent that deters rather than kills the insect. It is not an insecticide. Louse (Lice), red & white mites. It will stay on the animal for up to 7 days if kept dry.